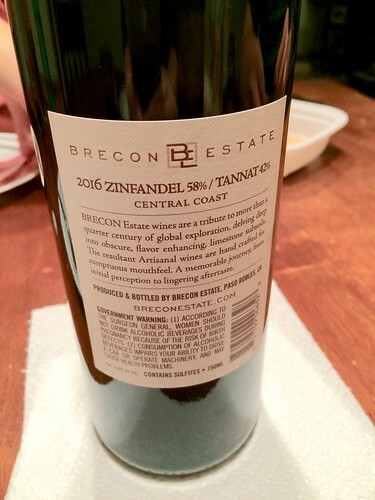 We purchased this bottle of wine during our visit to Brecon Estate back in the Fall, http://wineandcheesefriday.com/brecon-estate-paso-robles-ca/. We visited the winery during our Paso Robles Wine Tasting Extravaganza day. That was our first time trying a Tannat wine and we even got to pair it with cheese that day. We liked it so much we figured we should take home a bottle and learn a little more about this grape made popular in Uruguay. We chose to do the pairing with Neil’s sister Marilou, so we headed over to the local grocery store to see what types of cheeses we could find. We chose two of our go-to cheeses, a goat cheese log, and some aged gouda. This evening we were having Wine and Cheese for dinner so we will also be including our pairings with Prosciutto, Salami, kalamata olives, green olives, gluten free crackers and Melba toast. As we swirled the wine, I picked up dark fruit aromas and some softness. Marilou thought the aromas made her eyes water but she usually drinks white wine so this could have been a bit strong for her. On her second sip, she found it to be a spicy wine and it seemed fruitier than other wines she has tried. Neil agreed that the wine was fruity up front and then spicy in his throat. I described the flavor as dark fruit, lots of spice and a lingering flavor. We all liked the wine so we’ll be trying Tannat again! Maybe the next time we can find a pure varietal one from Uraguay. We tasted the goat cheese log first. I spread mine on some Melba Toast and I could smell the toast and the milk. The flavor was salty, creamy and a bit tangy. Marilou really liked the smooth texture of the cheese. Neil jumped ahead of the cheese tasting and paired the cheese with prosciutto. He loved the pairing! The gouda smelled dry and rich and that richness continued into the flavor, along with the flavor of cows milk. It was really tasty! Marilou really liked the gouda too and made note of the texture of the cheese. Next we moved onto some pairings. We already know that Neil came up with the pairing of prosciutto and goat cheese but when Marilou put the gouda with the prosciutto, she said it was a totally different flavor blast! The gouda with the salami was good together also. Marilou went all in and tried the goat cheese spread on the gouda and said “Double cheese!”. I’d guess that was a good one too! We also liked the green olive with some goat cheese on it. Guess we were kind of having a free for all but it was a good time! 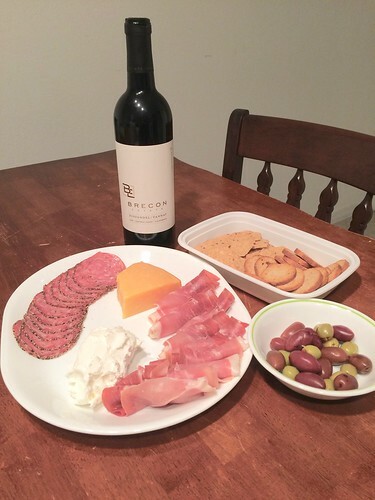 I took the reigns on some wine and cheese pairings so we could report back to all of you. My first pairing was the Zinfandel/Tannat and aged Gouda, where more spice appeared in the wine but less fruit. Strangely enough the opposite happened with the Zinfandel/Tannat and goat cheese log, there was more fruit in the wine and no spice. And when I tasted the wine and a kalamata olive, the wine became very peppery! How cool that different flavors appeared and disappeared when pairing this wine. Even more reason to pick up another bottle and try out some other pairings. So glad we got to taste a new varietal and it was great sharing it with Neil’s sister too. Curious about other wines we’ve tasted with Marilou?